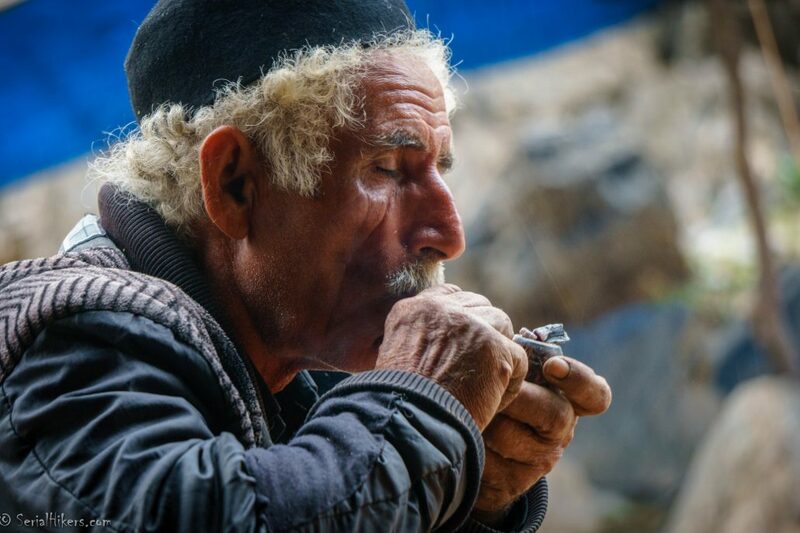 Meet the Bakhtiari, The Last Nomads of Iran Living in the West! Meet the Bakhtiari, The Last Nomads of Iran! We joined our guide and a group of tourists from Iran and elsewhere. Despite our tired faces, we soon got to know each other and shared our common enthusiasm for the upcoming adventurous trip. 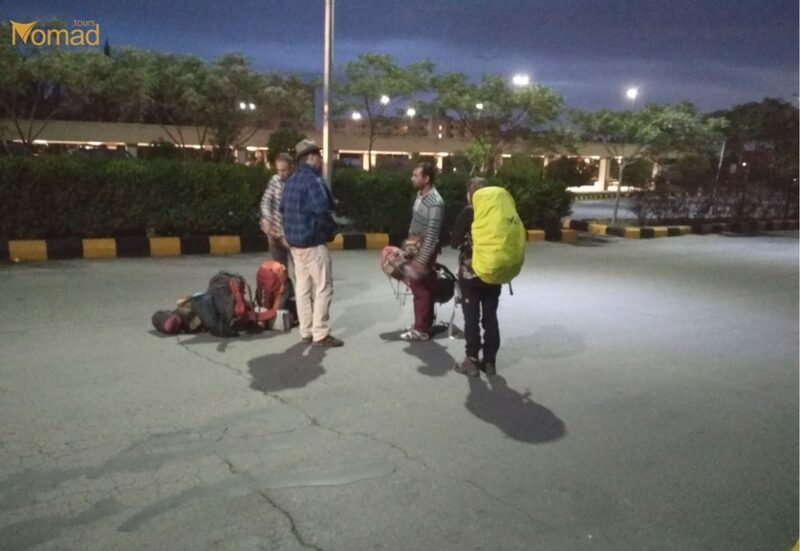 Together, we headed towards Zagros mountains, looking for our host family – fulfilled backpacks, trekking shoes on our feet, fully charged smartphones on hand. We had no clue what these days would be; we were only ready to live a rather unique migration experience with real nomads! First things first, finding Bakhtiari nomads in the mountains! The first difficulty arose when we arrived at the meeting point. In the heart of the mountains, it was impossible for us to locate our family host or to establish contact with them … How to communicate here, with people whose the migration way seems just as unpredictable as weather conditions? Fortunately, after having talked to several nomads on the road, our guide was able to find them… a few kilometers upstream. 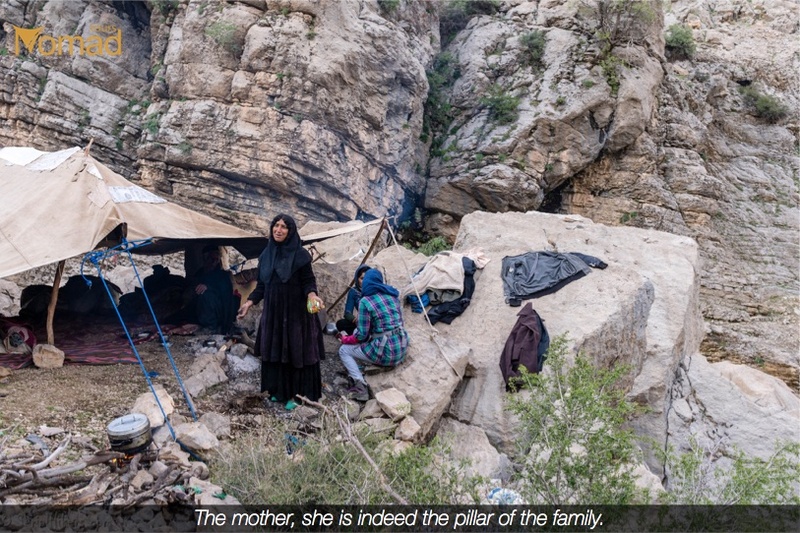 At the bottom of a steep valley, near a river, the family of Ali Mola was waiting for us: when a place is good enough for animals to graze, Bakhtiaris nomads set up their camp and main tent – a black cloth that absorbs the heat of the sun, held by wooden stakes. Inside, there is at least one fireplace, for cooking and warming up during cool mountains evenings, as well as large carpets on which Bakhtiari people sleep and eat. When we finally managed to set up our tents, the night just fell. Invited to have dinner with Ali Mola, his wife and five of his children, we headed to the main tent. On the menu, tonight: tea, rice, and dough for everyone! When we finished our plates, the mother went to milk her goats (whose fresh milk will be boiled and turned into yogurt after a night of fermentation) while Ali Mola and his sons gathered around the small radio station. What do you think is the most adversity in nomads life? Listening carefully to the weather forecast and organizing their respective shifts. Shifts? We didn’t have any guess about it when we arrived, but we realize very quickly that the hardest thing in a nomadic migration is not walking… but taking care of the animals. The storm of the first night set everyone up at 6 am: the water flooded our tents; animals began to shudder with cold (despite the thick fur of Angora goats) and the dry wood collected for the fire was totally wet. We waited after the sun in the morning to warm up, dry all our stuff and decide for the future. Bakhtiari nomads women, the most sacrificing in the family! 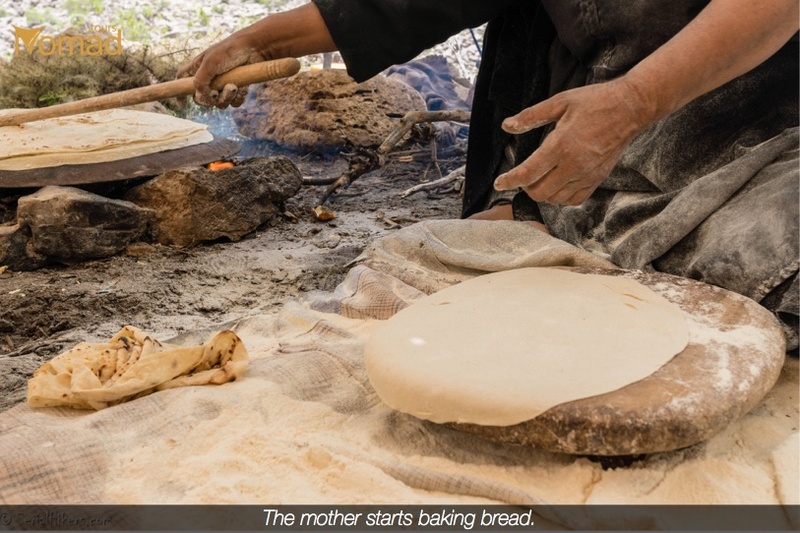 While Ali Mola went to the local council among other Bahktiari men to decide whether or not to migrate the next day (weather, lack of food, fatigue of animals…); the mother and her daughters began to make bread, an essential element of nomadic meals. We watched them, fascinated, skillfully rolled out the dough while the first bread was cooked on a metallic dome above the fire. The mother, dressed in her long black dress and her veil revealing two strands of perfectly curly hair, maybe discreet, she is indeed the pillar of the family. She cooks, sets up the tent, carries water, milks goats and regularly loads/unloads donkeys with heavy bags. The bags containing all the family’s belongings. Bakhtiari women, often uneducated, poor quality shoes at feet. They have no choice but to follow their men (husbands, sons, fathers) in all circumstances. Speaking of men and decisions, the Council of the day has just decided: tomorrow, we have to leave! Unfortunately, the persistent bad weather on the second day with nomads puts an end to any hope of walking . A curse for Ali Mola who, in more than 40 years of migration, has never experienced so much rain. We stayed under the tent, sitting around the fire. Taking advantage of this moment of misfortune to question our guests about their lifestyle, with the help of our guide. “Tell me Ali Mola, isn’t it too hard for your children? “No, it isn’t, because they like to be in nature, with animals. My eldest son went to Isfahan. He found neither work nor woman and sat all day in front of the television… ” He was interrupted by one of his young sons. 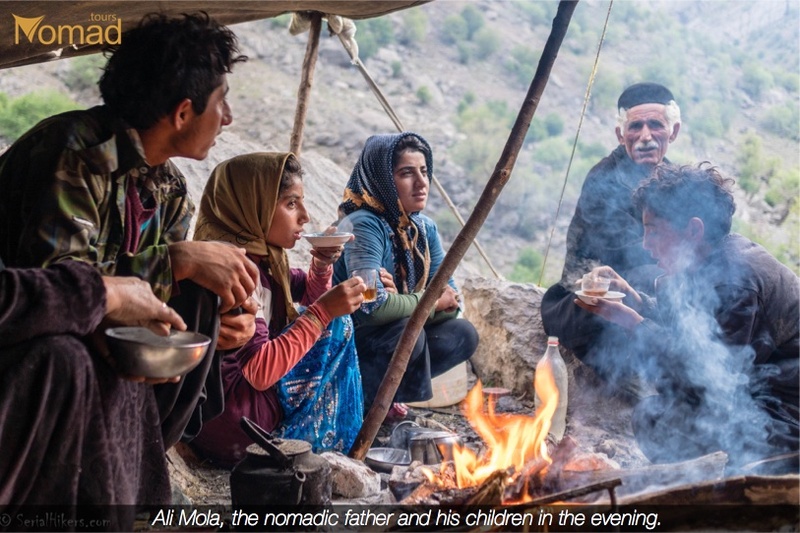 Is it really an adventure to accompany Bakhtiari nomads of Iran? 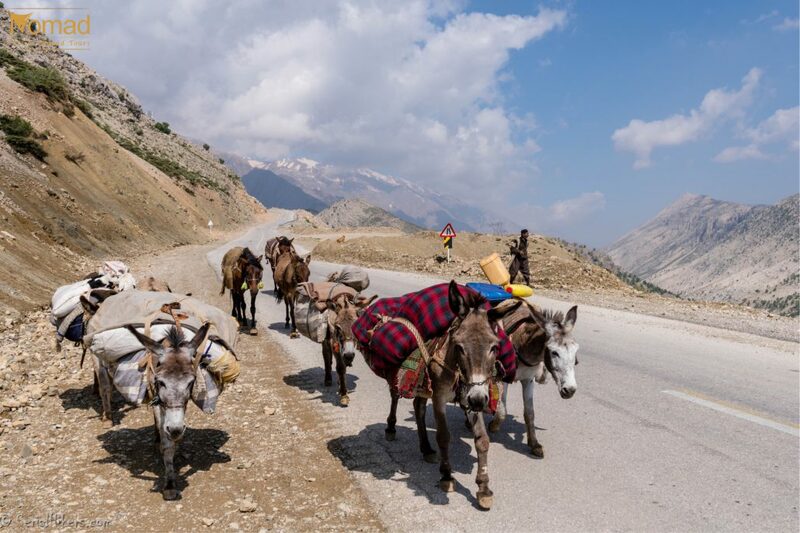 Despite our tired-looking features, we will not have a single time to complain; after swallowing a bowl of fresh yogurt and packing our stuff, we had to load donkeys and set off very quickly. In the processional order, men went first with goats and sheep. 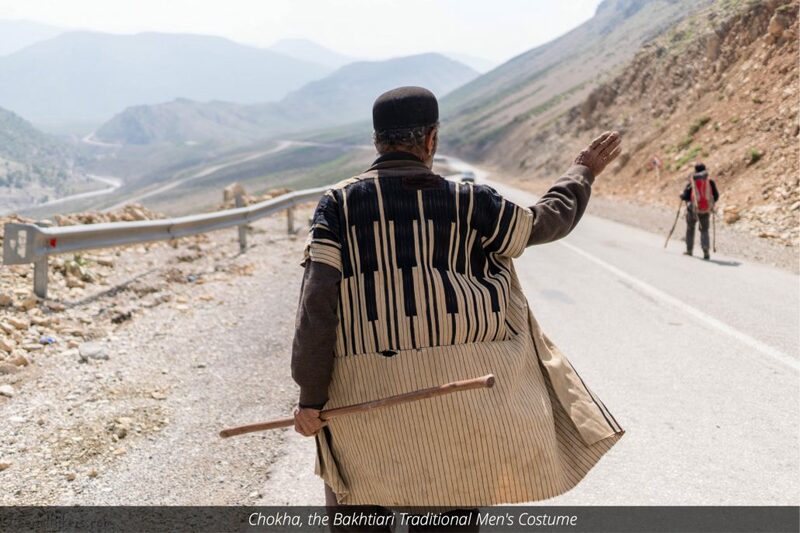 Dressed in his striped vest, harem pants and black hat, wooden stick in one hand and gun in the other; Ali Mola will walk with his sons and flock the steep and stony slopes of Zagros mountains; the paths that these animals with their hooves have no trouble climbing. The mother and her daughters set out afterward; they will lead by foot or on horseback, on more suitable paths, the few donkeys carrying the heavy belongings and the newborn goats, too weak to accomplish this long walk. The eldest daughter will give the impulse, the steady speed of the walk. At the age of 19, with her rifle slung over her shoulder and her assertive personality, she has just been married. This migration will be the last with her parents: next fall, she will leave her family to join her husband. Not accustomed to such a speed, we will stay mostly behind, taking advantage of our last position to immortalize in pictures this incredible migration. 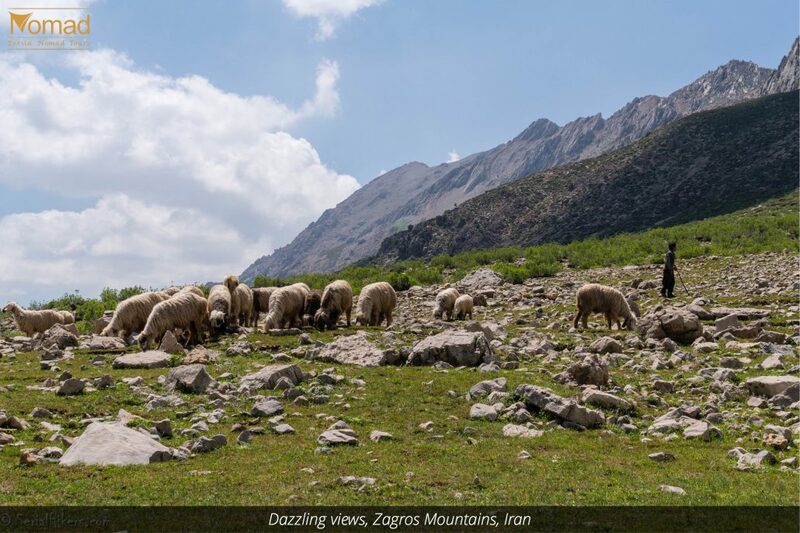 The passage of the exceptional Zagros mountains under a radiant sun will make us almost forget the icy water of the Bozoft river, which was necessary to cross on foot, and the 15 kilometers walked until arrival. We will end this trying journey much better than we started it: after improvising a shower under a small waterfall, taking a more substantial meal by the fireside; we will enjoy a much quieter night, under a perfectly starry sky. After a brief farewell, we let our host family disappear in the mountains, with only the echo sound of hooves, bells, whistles and animals sounds. It will take them a good ten or so extra days to reach their final destination. As for us, it will take us several hours of transport to reach the capital, and a few days of rest to fully recover from this crazy adventure. One thing is certain: we will not soon forget about it!